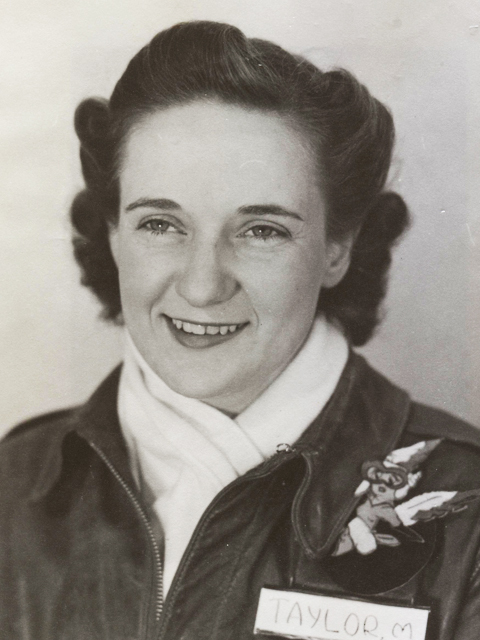 WASP Madelyn Marie Taylor Eggleston, a graduate of Class 44-W-1, was born Saturday, June 7, 1919 in Red Oak, Iowa. She was the daughter of the late Lawrence B. (Cap) Taylor and Blanche Beeson (Taylor). When she was 9 years old, her father took Madelyn to a local airport to watch an air show. The young girl persuaded him to let her go for a ride. From that day forward she never lost her desire to fly. She graduated from Red Oak Junior College but reenrolled the next year in one class so that she would be eligible to take the Civilian Pilot Training course. Each CPT class of 10 would only accept one girl. Madelyn was chosen to be that girl, completed the course and earned her private pilot license. In early 1943, when Madelyn learned about a program training women pilots to fly American military aircraft, she applied(1). After passing an interview, entrance tests and an army physical, she was accepted into the first class of 1944. She arrived at Avenger Field, Sweetwater, Texas in the fall of 1943 along with 100 other hopeful young women pilots. After completing seven months of Army Air Force flight training, she and 48 of her classmates, graduated. They were the first class to wear the brand new Santiago Blue uniforms. After graduating, Madelyn was assigned to Las Vegas Army Air Field. She completed instrument school and was then assigned as an instrument instructor for male pilots. While stationed in Las Vegas, she met and married a B-17 bomber pilot, G.B. "Gil" Eggleston on Nov 3, 1944. After the WASP were disbanded and WWII was over, the young couple eventually moved back to Texas and settled in Vernon in 1952. Madelyn was active in her growing family's life. She was a homemaker and served as den mother in cub scouts and group leader for campfire girls. After her children were grown, she went back to school and graduated from the Vernon College LVN program. She worked as a licensed vocational nurse at Center North for over 18 years. Madelyn was a member of the Eastern Star and a past worthy matron. She was a longtime member and very active in the Central Christian Church, was in CWF and sang in the choir. She was active in charity work, loved gardening, art, watercolor painting and china painting. In 2010, long after her service as a WWII AAF pilot, Madelyn and her fellow WASP were awarded the Congressional Gold Medal for their service during World War II. It is the highest civilian honor our nation can give. Surviving to honor her memory are sons Edward B. Eggleston and wife Toya of Vernon, TX and Jon T. Eggleston of Vernon, TX; daughter Evelyn Wilson and husband Jim of Stamford, TX; grand children Robert Eggleston, Allison Harding, Cody Shores, Amy Cervantes, David Shores, Tracy Wygal, Robert Wilson and Ashly Eggleston; and 13 great grand children. She was predeceased by brothers, Bill Taylor and Eldon Taylor. Visitation was held on Monday, May 23, 2016 from 7-8 pm at the funeral home. Funeral service was held on Tuesday, May 24, 2016 at 10:00am at the Central Christian Church with Rev. Jim Antwine officiating. Interment followed at Eastview Cemetery. Services are under the direction of Sullivan Funeral Home. Memorials may be made to the Central Christian Church. The family would like to thank the Hospice workers and the home health care workers for all their special care. 1 During WWII 25,000 women applied to the WASP program (Women Airforce Service Pilots), but due to the rigorous training and strict qualification requirements only 1,830 were accepted into training and a total of 1,074 graduated. v/r posted by Nancy Parrish including the original online obituary and additional information on Madelyn's service as a WASP. Photo from Wings Across America's digital archive.